Check out our range of fun turtle facts for kids. Learn about turtle shells, the biggest turtle species, turtle eggs and much more. Read on and enjoy a variety of interesting information about turtles. Turtles have a hard shell that protects them like a shield, this upper shell is called a ‘carapace’. 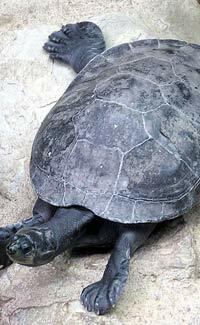 Turtles also have a lower shell called a ‘plastron’. Many turtle species (not all) can hide their heads inside their shells when attacked by predators. Turtles have existed for around 215 million years. Some turtles lay eggs in the sand and leave them to hatch on their own. The young turtles make their way to the top of the sand and scramble to the water while trying to avoid predators. Sea turtles have special glands which help remove salt from the water they drink. Many turtle species are endangered.